Do you believe in spirit animals, otherworldly guides who appear in your life to offer love, healing, and support during difficult times? I do and I have one! But I'm not the only one. Many cultures also believe in spirit animals or totem animals including the Mexican culture who have Alebrijes, brightly colored folk art sculptures. 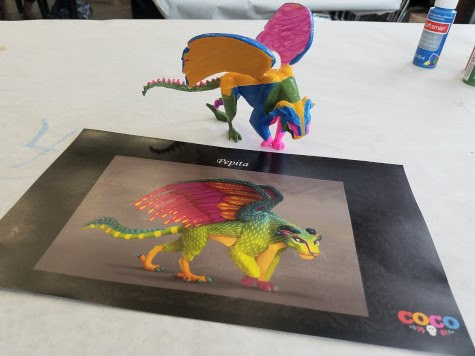 To learn more about Alebrijes and how they fit into the world of Disney•Pixar’s COCO, I attended the "Create Your Own Pepita" Alebrijes workshop. 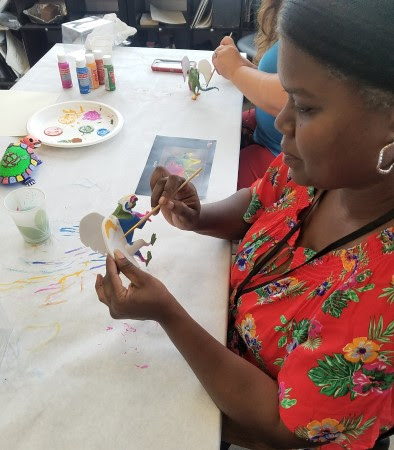 While there I had the chance to paint my own Alebrijes, while learning some fun facts about these colorful creatures. In 1936 Pedro Linares Lopez created Alebrijes after recovering from a illness and fever dream. In the dream Linares saw inside a forest, unusual animals including donkeys with butterfly wings, a lion with an eagle head, and many different colorful animals who were chanting "Alebrijes". When he felt better, he started making Alebrijes out papier-mâché. Modern Alebrijes are now made out of a special type of copal wood and have became one of Mexico's most recognized forms of art. .
Alebrijes don't have any mystical or religious symbolism to them. The artist decides how a Alebrijes is formed. Each artist brings their own tastes into the sculpture. The colors and brightness of Alebrijes are the same type that you would see all over Mexico. 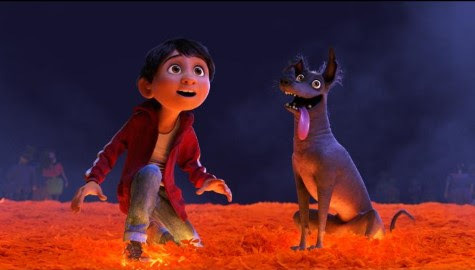 While the Alebrijes are not related to Dia De Los Muertos (Day of the Dead), the animators wanted bring the art of Alebrijes out into the world and into Pixar’s COCO. So they made them spirit guides. Pepita is a Chimera like animal, so a mix of different animals. There's a tail that's lizard-like, feet that are eagle-like, feather on the upper body, gorilla-like front arms, ram horns and a tiger face. 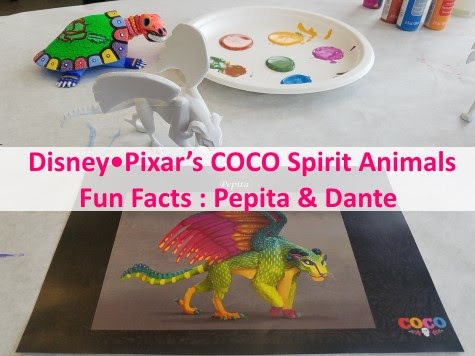 While it was fun to learn about and paint my own Pepita, that's not the only spirit animal found in Pixar’s COCO. Dante might seem like a regular dog but there's lots more to him. Dante is actually based on a real dog breed, the Xoloitzcuintle or Xolo for short. The Xolo is considered a hairless dog breed that is native to Mexico and Central America. While they're considered "hairless" they do have tuffs of hair at various parts of their bodies. These dogs have been around since "ancient" times and are used to safe guard homes from bad spirits, believed to have healing powers and serve as spirit guides for the dead as they travel from the land of living to land of the dead. Dante is suppose to be a street dog. So he's animated a bit slim and scruffy with ripped ears. The missing teeth are a common trait in Xolo dogs. This led to having the tongue sticking out. The animators referenced Hank from Finding Dory. Hanks tentacles did a lot of movements so used the same animation "rig" when working with Dante's tongue to get a free range of movement. Dante is considered a puppy is a adult dogs body. So his moves are a bit clumsy. To get the correct movements the animators watched YouTube videos of dogs. They found dogs are naturally entertaining. So Dante has a lot of stumbles, etc. I was amazed how the animators brough both Dante and Pepita to life. They both serve important roles helping Miguel find his family and his destiny in Disney•Pixar’s COCO. Get ready to see them in action in theaters everywhere on November 22nd!